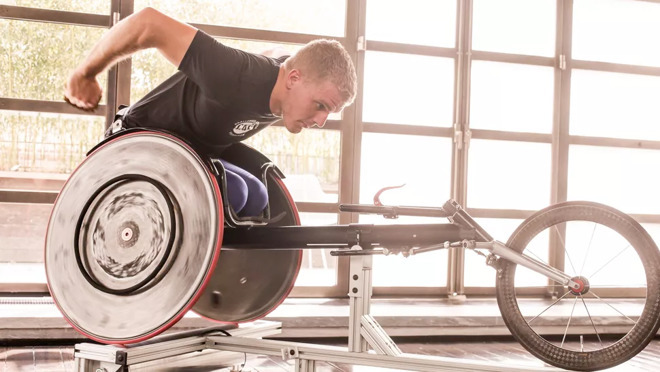 The Apple Watch has helped to improve the way U.S. Paralympian Austin Pruitt trains, a report reveals, highlighting Apple's work to make its products and services accessible to all users, ahead of Global Accessibility Awareness Day occurring on Thursday. Austin Pruitt, who competed in the 2012 and 2016 Paralympic Games, revealed to CNet the use of the Apple Watch helped reduce the amount of items required to monitor the workouts. As cerebral palsy affects his legs from the knees downward, Pruitt competes in a racing wheelchair. Usually set up to be stationary for workouts, numerous trackers were previously attached to the chair to log workout sessions, but this has since been streamlined down to just an Apple Watch. While not fully described, it appears that the Apple Watch is the only device being used, employing the fitness tracking to monitor the wheelchair-based workouts, as well as the activities of everyday life. "This has everything," Pruitt advises. "This has my wheelchair and my walking, all in one." Global Accessibility Awareness Day, taking place on May 17, aims to encourage the design, development, usability, and related communities to make their software, hardware, and related services more accessible to people with disabilities. "Every year we try to add in new things. We do look at how we can make it slightly better year over year," said Apple director of global accessibility policy and initiatives Sarah Herrlinger about iOS and macOS' accessibility developments. Herrlinger noted iPhone-based accessibility features including text-to-speech to read messages aloud, and the ability to pair hearing aids and cochlear implants to the smartphone using Bluetooth. When cooking, Herrlinger highlights the ability for a visually impaired person to identify specific spices by using a barcode-reading app on their iPhone, and verbally requesting to a HomePod to turn on a HomeKit-connected appliance. Apple is also said to have collaborated with the producers of portable Braille readers and paddle switches to use an iPad, and to enable closed captioning or audio descriptions for content playing on an Apple TV. A similar effort to highlight its work took place last year, demonstrating the utility of VoiceOver, Siri, HomeKit, and third-party apps to help improve some user's lives in a series of videos. Last year, it was revealed Apple had worked with Australian firm Cochlear on new implant sound processors, which offer deep integration with Apple's devices for those using the hearing aids. More recently, Apple submitted proposals for a number of disability-related emoji to the Unicode Consortium.